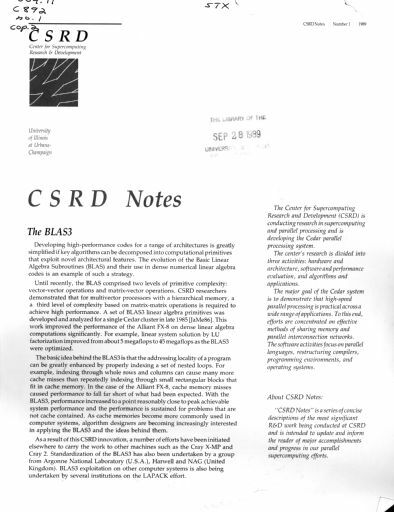 Digital Surrogates from the Supercomputing Research & Development Publications contains a digitized newsletter (CSRD Notes, 1989-1990), concerning descriptions of the most significant Research and Development work being conducted at the Center for Super Computing Research and Development (CSRD). The Supercomputing Research & Development Publications (Digital Surrogates), 1989-1990 are managed by the University of Illinois Archives and do not feature precise descriptive information for each item. Discover their contents by browsing the folders and files. For more information, contact an archivist at illiarch@illinois.edu.